Wonderful world! 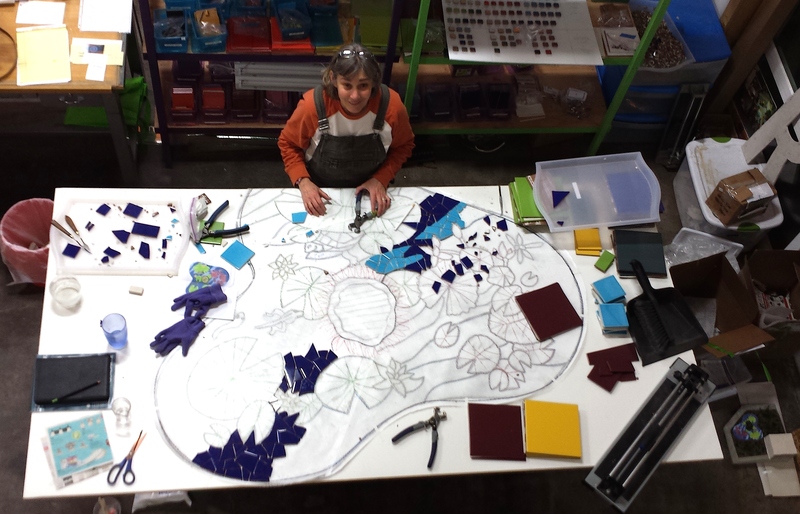 My friend and fellow mosaic artist Lynn Adamo and I applied for a large public art project in McMinnville, Oregon last year for a new bus station/rerouting center. 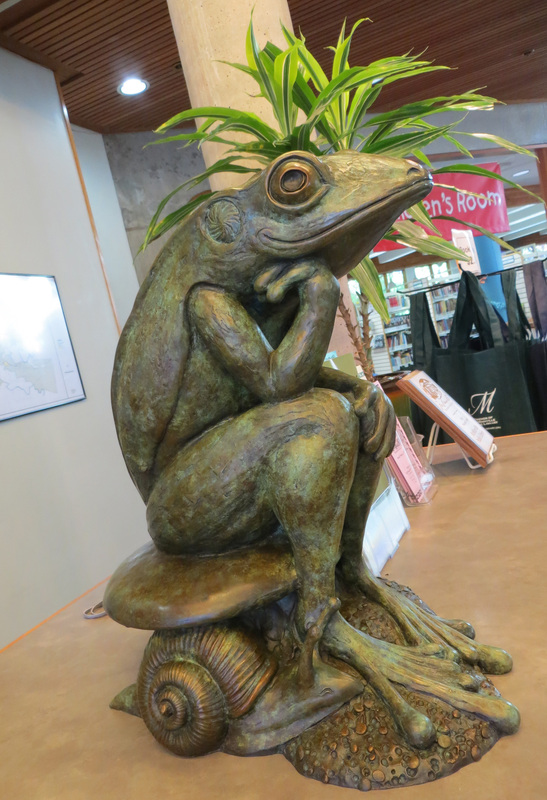 It all started with a bronze frog sculpture that was gifted to the library some years ago. 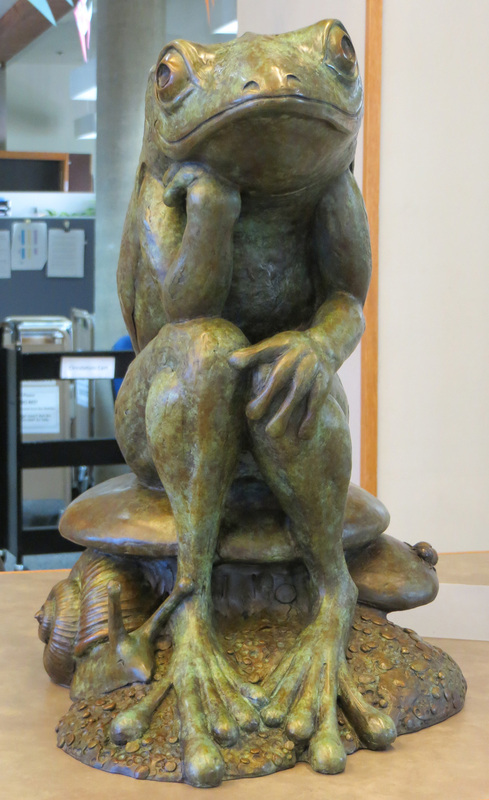 This cute contemplative frog is being relocated because of the renovations. He needed a new home, and we were being hired to create it! 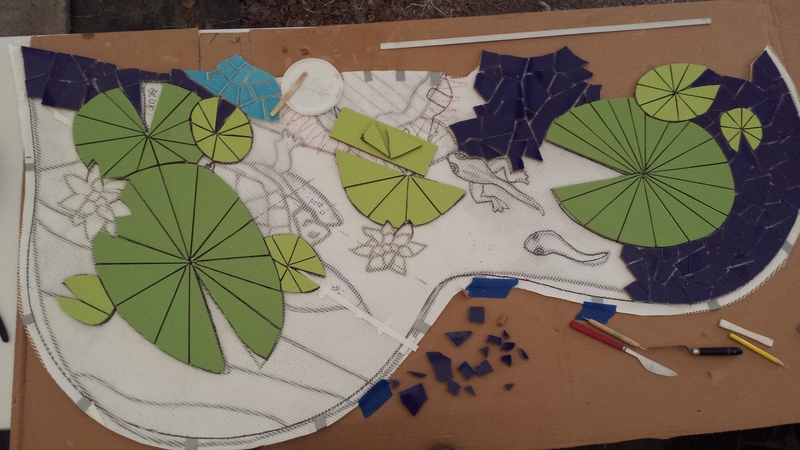 The client requested a mosaic “pond” to be sited in an existing planter bed close to the front doors. Now… Lynn and I live at opposite ends of the state. We weren’t really sure how we were going to do this, but this is what we decided. and she did the in person meetings (since she’s far closer to McMinnville) and got a full sized copy made of my design. We chose and ordered tiles with lots of back and forth, online and on the phone. And then Lynn made the cutest maquette ever! To begin the hands on part, we met up in Bend, at our friend Rochelle’s awesome studio Wild Rose Artworks (thanks Rochelle), to split the materials and layout the full size cartoon onto mesh. 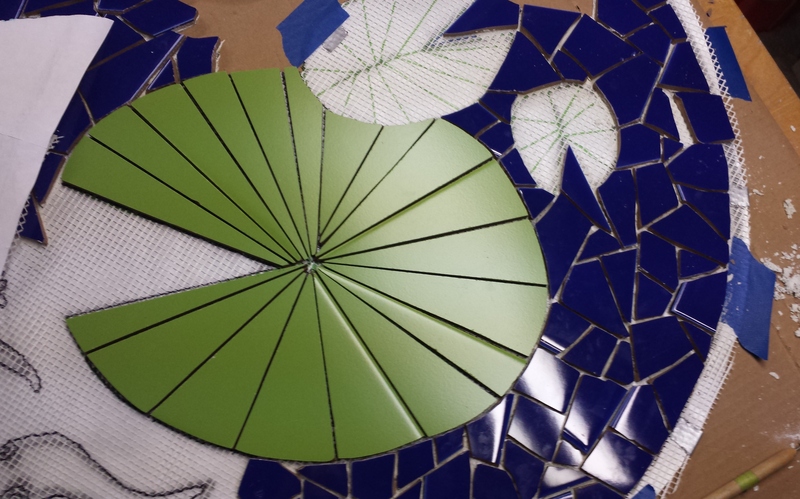 Next we tiled along the imaginary center line, then when it was set over night, we cut the mesh into two large halves and brought them back to our respective homes to work on them. So far, this is how it’s going on my end. 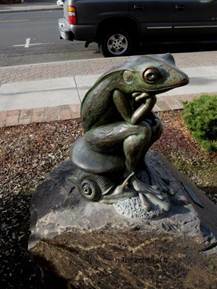 I am also on the search, via a rock hound friend, to find the perfect rock for the frog sculpture to sit on in the center of the pond. In addition to all this great work that’s finally going on, I was accepted into the Rogue Gallery 2015 Biennial! The show is a collection of works from artists of the Rogue Valley. Please check it out when you can, it opens Feb.20th (from 5-8 pm) and will run through April 10th 2015. Greetings to all my loyal friends and art enthusiasts! I wanted to let you all know what is happening in my life and on the Horses of Equamore mural (FINALLY!). 2014 was a crazy busy year for me, beginning with receiving a $4,000 grant from the Haines Foundation of Ashland in late July! I proposed creating a mural I could call my creation from start to finish as a way to build my portfolio and help myself get future work as a mosaic artist. I was excited, but also a bit daunted, as I knew I would have to raise at least $10,000 more in order to really “get paid” for all my work. 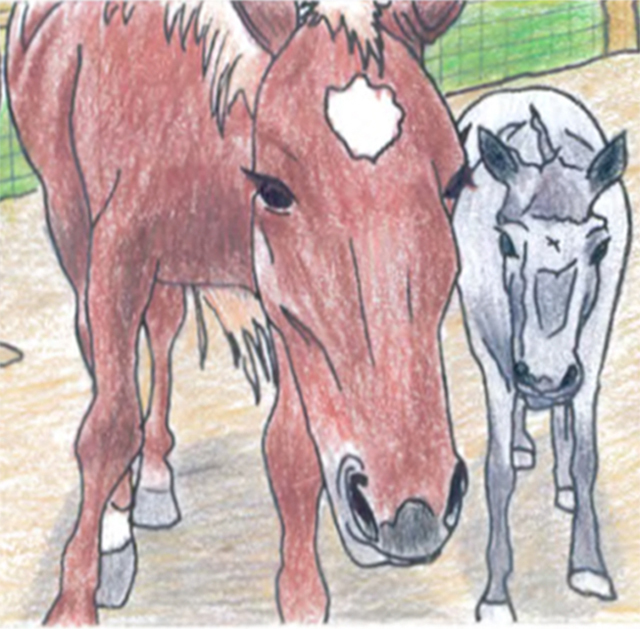 I chose the theme of the mural, the horses of the Equamore Foundation, as I felt that there was a strong connection between the community of Talent where I live, and the horse culture that is all around us here in the Rogue Valley of Southern Oregon. I was introduced to the foundation by Anna Clay, owner of the Grotto Pizza where the mural will be installed. Anna is a huge supporter of animal welfare causes, so it seemed a good match to me, and luckily she agreed! 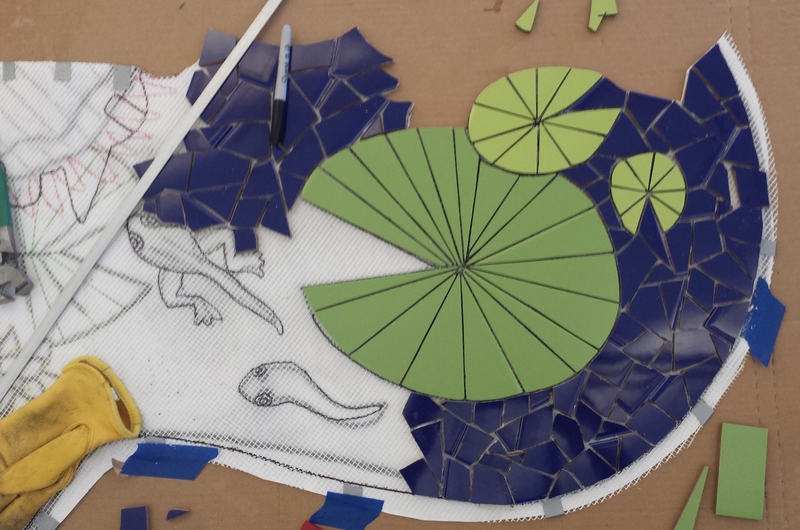 Here is a link to the mock up of what the mosaic will look like, minus a good number of wildlife tiles that will be added in to the final piece, in situ. I also had to go through the City of Talent to get approval from the City Council, and still have to get permits finalized through Planning before installation on the Grotto. In August I put together an Indiegogo.com crowd funding campaign which started in early September and ran for a month. I slowly started raising money one dollar (or sometimes 75 cents!) at a time. In addition to the horses, the mural will also include many other examples of wildlife that can be found in Southern Oregon. 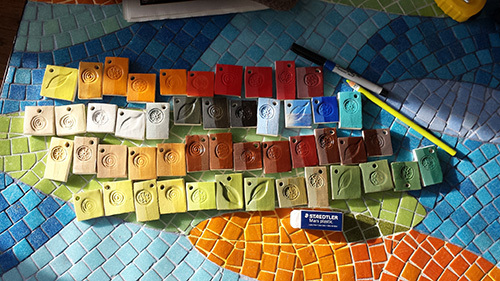 I “sold” folks the chance to have their names put onto an animal tile from a selection of around 45 tiles, which will be set into the final mosaic as an integral piece, rather than as an aside. 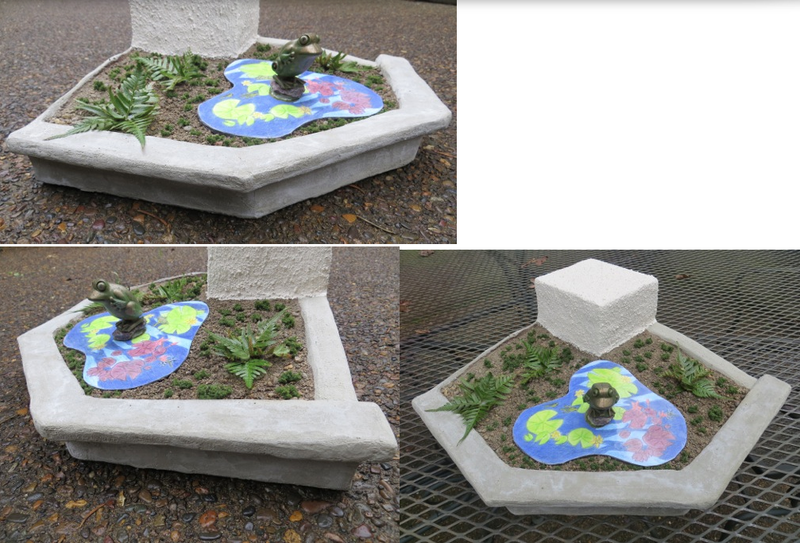 I liked the idea, which I borrowed with permission from Eileen Barr who co-created the 163 steps project in San Francisco. She was a great resource for me in terms of how to handle fundraising and integrating the community into the project. Thanks Eileen! I was ultimately successful in the last hours of the campaign and made my goal, which enabled me to pay a lower fee to Indiegogo and keep more for the project! THANK YOU to everyone who pitched in, large or small, it all matters! I am feeling so blessed and so happy to have the support of the community, my friends, and my family. Then I took the next 6-8 weeks for prepping wares for the annual Clayfolk Show and Sale at the Medford Armory, which was also quite a success. More good vibes! 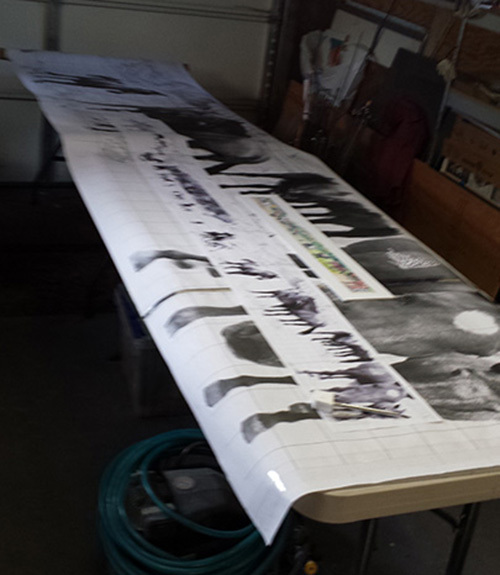 I began right after the Clayfolk Show getting set up to create this giant project consisting of a 27 foot long, 2.5 foot tall handmade ceramic tile mosaic depicting the horses of the Equamore Foundation, a local rescue for abused and neglected horses. 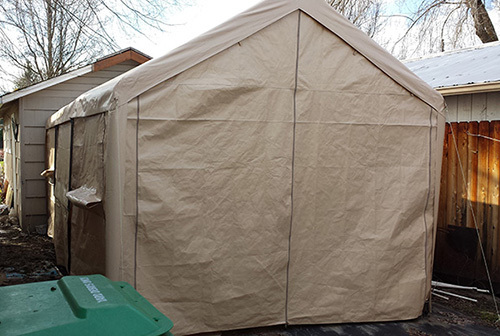 I purchased a “portable” carport/tent to use as an outdoor annex to my tiny studio. You can see the back of my studio just in front of the tent. It looks small here, but is 12 x 20 feet of room that I’m loving having already. It will be even nicer when it warms up and I can be out there all the time! 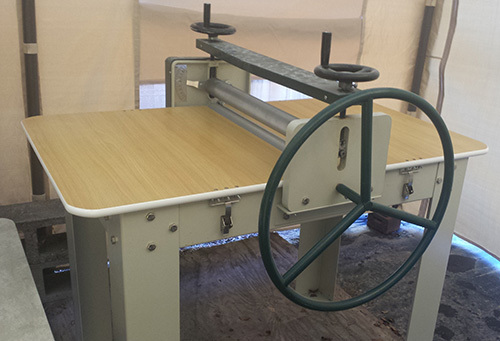 Next, my friend Rick Evans, fellow artist, and previous co-worker from Illahe Tileworks, found me a used slab roller on Craigslist. I’ve wanted one of these for a long time, but never had the space. Now I do! It’s very exciting and I rolled out my first slab today. I’m a little rusty on the how part, but it HAS been about 6 years since I’ve used one of these babies. 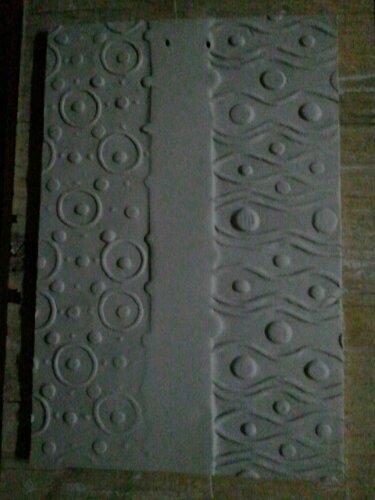 And I’m attempting to do large slabs of clay — approximately 24″ x 30″. I’m feeling my age today! Once I’m done with this blog post and the slab has stiffened up just a little, I will begin to cut out the shapes for the first pieces. Whoot! Whoot! I had the full mural design blown up onto paper at 111% original size to use as a template. I coated the entire thing with clear contact paper to protect it from tearing and make it more resistant to the moisture in the clay. 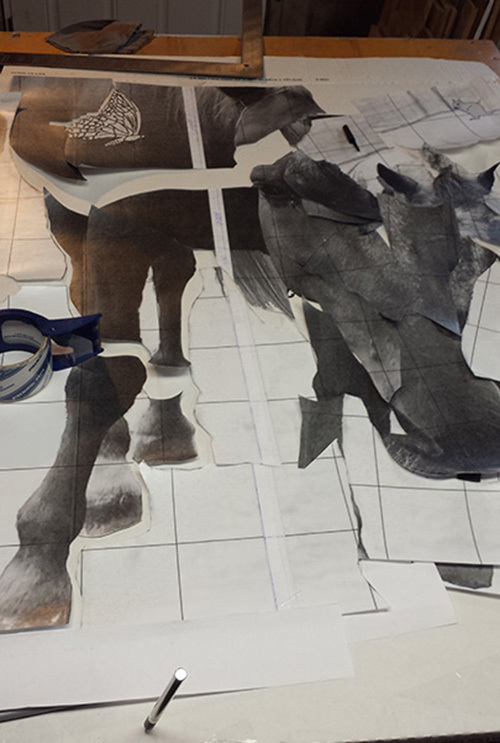 Then I cut out pieces from the template that would be more manageable in size and shape. 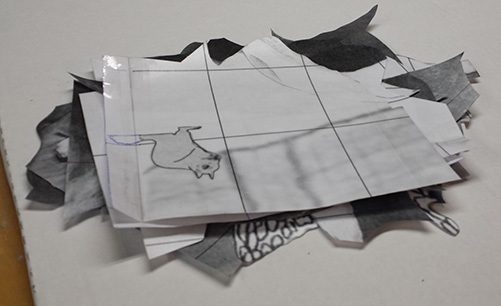 I made a corresponding “map” of the final piece so I knew where each piece would go once they were finished. Yep. I pretty much just made a giant puzzle! Each of these pieces will be placed on the clay and cut around as well as transferring the design to the face of the tile as a guide. I still am a little undecided how I’ll tackle creating “mosaic” pieces for the background, but I think it’ll work out. Sometimes you have to figure things out as you do them to see what will work and what won’t. And finally today, I’ve been creating my own version of the whole 50 Shades genre by doing glaze tests for the project. My own 50 Shades of Clay! I am using Amaco Velvets underglaze with a clear sprayed on top to bring out the color and protect it from the dirt and weather. I’m loving the palette so far. I realize there are only 48 colors here, but more tests are on the way! That’s where I am on the process so far, as I am concurrently working on a public commission for the McMinnville Library. 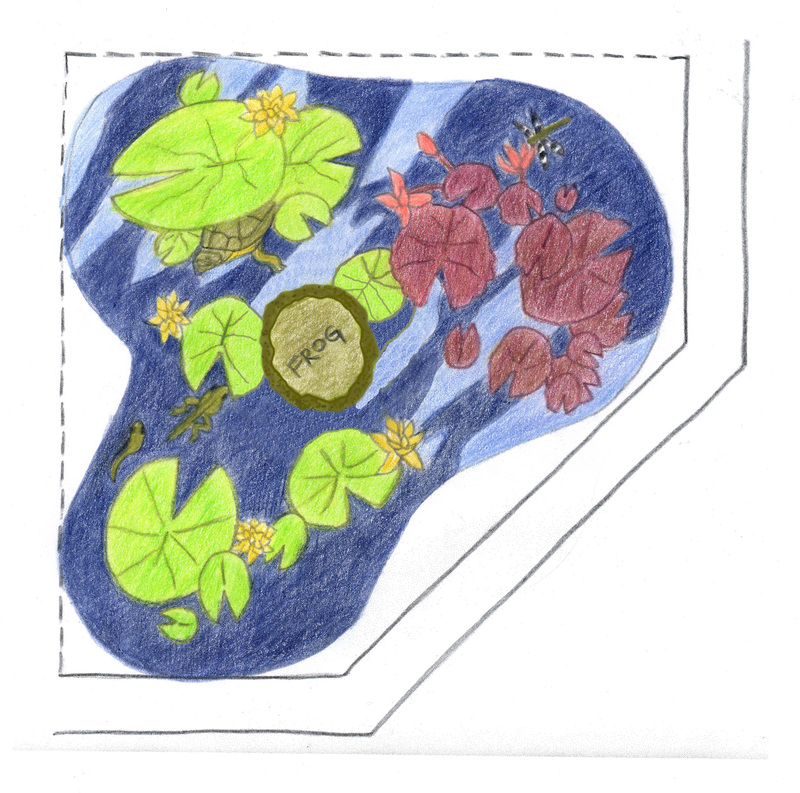 This will be a lily pond mosaic I’m co-creating with my friend and fellow mosaic artist Lynn Adamo of Hillsboro. Coverage on that project in the next blog post! Oh! and don’t miss seeing how all the Haines Foundation recipients used their grant money — join all 18 of us at the Ashland Art Center on March 6th (First Friday) from 5-8pm for an exhibit of everyone’s works and works in progress! I finally finished Pete and Carol’s tiles last week and they picked them up Tuesday (yeah!). Now it’s time to make some work for the June “Art for the Garden and Home” show. Save the dates- June 7-9th up at the top of Wimer St. in Ashland, OR. 447 Pape St. And 421 Prim St. Both just off Wimer. There will be tons of signs! Times are from 10-5 Friday and Saturday, and 10-3 on Sunday. 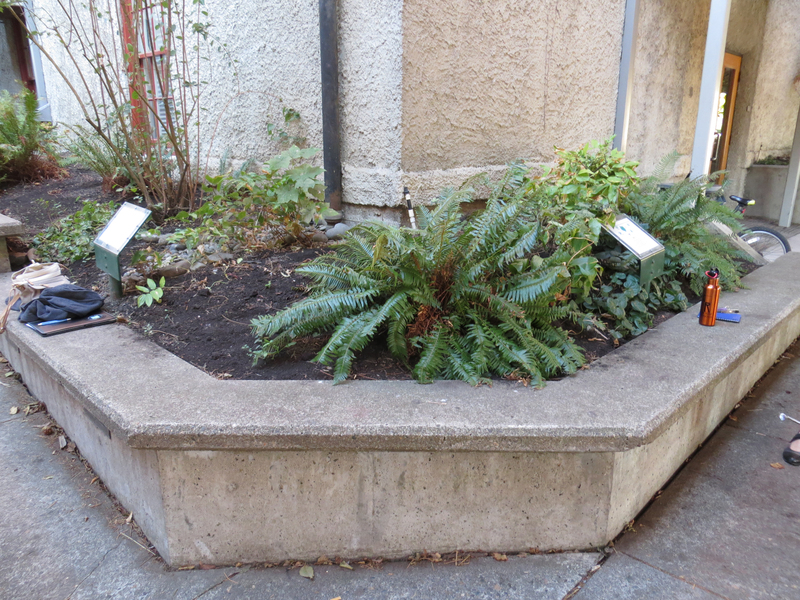 Mary Dee’s garden is also on the Ashland Garden Tour-so plan ahead Sunday so you have time to see both the art and the plants. 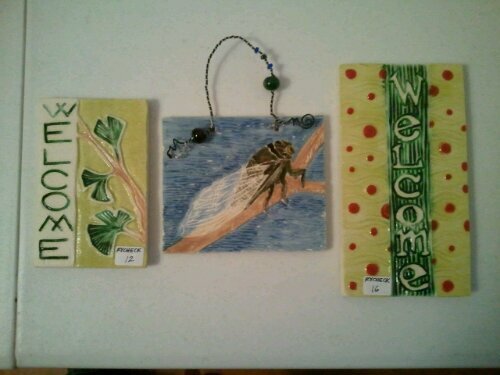 I’m beginning this week by making my ceramic plaques. I roll out my clay the ol’ fashioned way with a big rolling pin, just like making biscuits! 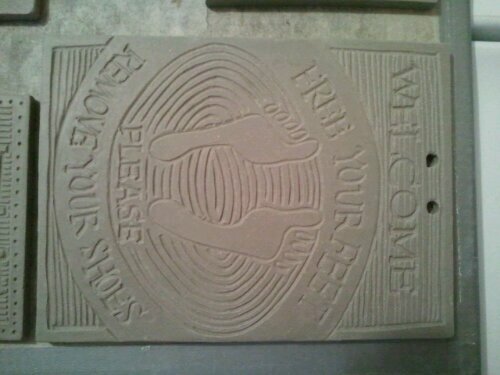 After the clay sets up for half a day or so, I cut it into the basic sizes I’ll use for the individual plaques. Then I wait several more hours, or overnight to add carved details like wording, or individual designs. Once the tiles are completely dry, they get their first firing, or bisque (1830°F). 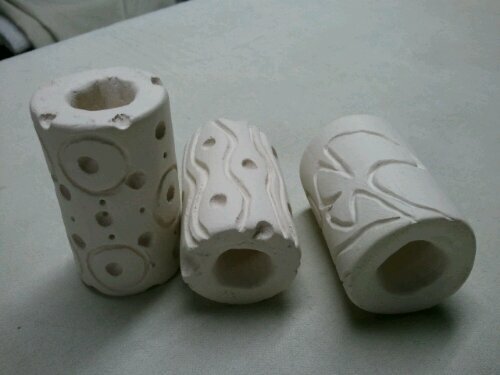 It takes about 12 hours for the kiln to come up to temperature, and 12 hours to cool. After that, I either glaze them using handpainting of glazes or underglazes for color-and spray with a clear glaze if needed. Then a high firing up to cone 5 (2185°F) for another 12 hours. After the tiles have cooled for about 12 hours, I can touch them without burning myself. I add hanging wires and beads to some, others have built in wires on the backs. And little felt dots so your wall won’t scratch! And that’s why it takes so long to make these little guys and why they aren’t $2 each! Lots of love and attention is taken with each piece, and no two are exactly the same. I also make these to order-so keep me in mind for addresses, special messages, new homes, etc. But give me at least two weeks to a month to get it done! 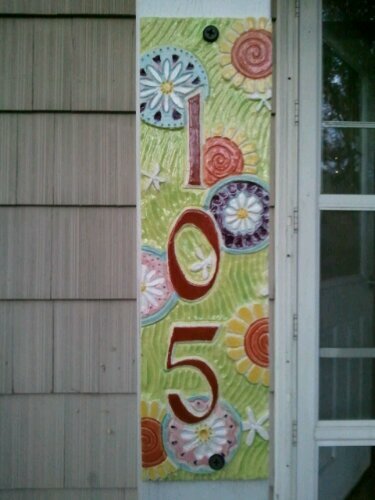 Here’s the address tile I made for my house. This is just one of the ways I make these tiles. I’ll save the other subtractive method for a future post. Hope you enjoyed your mini tutorial!